These free quilt-block patterns include projects for beginning quilters and experienced quilters alike. You'll find quilt blocks of all sizes, from miniatures to oversize designs. Some are even large enough to make a one-block wall hanging! Many of these quilt block patterns are multipurpose and include instructions that explain exactly how easy it is to make either a group of blocks or an entire quilt. Many patterns are written to help you make multiple sizes of a design. 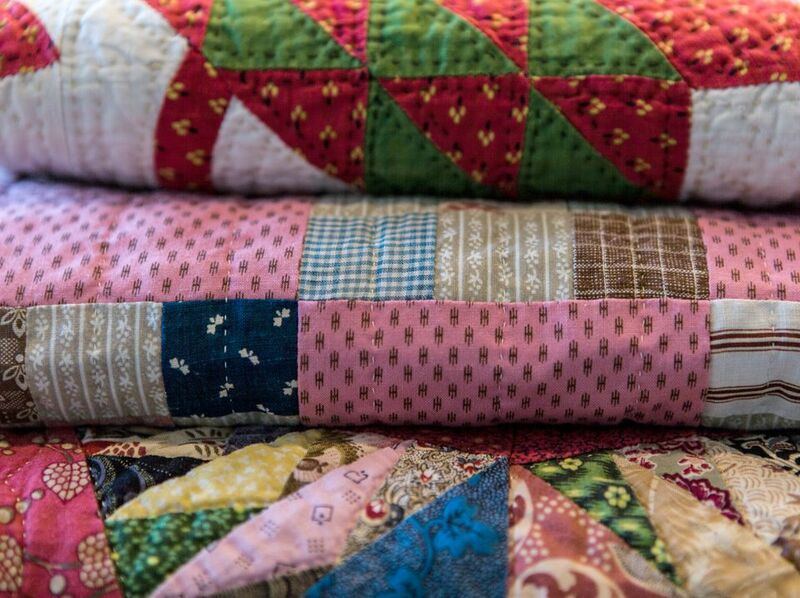 The traditional rosebud quilt block has been called many names over the years, including hummingbird, crow's foot, and a bright star. It's a delicate-looking block that's part pinwheel, with barbed tips that give you the opportunity for extra color play. Try it with a white or neutral background as shown, or sew brightly colored "flowers" on a rich black background. The block finishes at 12" square. The traditional patchwork Scottie dog quilt block is assembled from a combination of squares, bars, half-square triangle units, and one-quarter-square triangle units. The pieces for this little Scottie are all rotary cut and quick pieced. Be sure to try this 10" quilt block pattern if you love interlocking designs. It's similar to some of the Celtic twist blocks and so easy to assemble. The design emerges when blocks are sewn side by side. As you can see, the sawtooth quilt block can be changed dramatically by altering the color value of its patches. That's true for all patchwork quilt blocks, and an element to keep in mind when you choose fabrics. Bright pinwheels against a blue sky create a brightly colored pinwheel quilt appropriate for kids and adults alike. The Sarah's choice quilt block can be assembled in several ways. This pattern lets you put it together quickly using half-square triangle units at its center and simple flying-geese units (along with square corners) for the block's outer rows. Included are cutting instructions for four different sizes: 4", 6", 8", and 12" blocks. You also can preview mock-ups of the blocks set into two different quilts, one on-point and another with blocks arranged horizontally. The mock basket weave quilt block proves that easy quilt blocks don't have to be boring. Instead of piecing stripes within each patch, you'll simply choose two striped fabrics, then alternate the stripes and the directions they flow when you assemble the blocks. The result will be a quilt that looks a whole lot like a true basket weave​ but without all of the fuss. Try stitching this block in colorful, whimsical stripes to make a fun quilt for a child. The instructions include yardage and cutting charts for 12 (6" blocks) and 12 (12" blocks). Maple leaf quilt blocks are sewn in fall colors of red, orange, or yellow with light or medium blue backgrounds with finished block sizes of 9" square. Use the colors shown as a guide to help you assemble the double pinwheel block, or choose any colors you wish. The center pinwheel is a combination of dark blue and bright yellow. The pinwheel extensions are lighter versions of both colors to help add movement to the block. Finished block sizes are 12" square. This version of the bento box quilt block is a good choice if you'd like to go a bit scrappy. The block finishes at 12" square and is easy to construct. You'll assemble this easy bow tie quilt block in no time. Don't worry, it doesn't have set-in seams, every seam you'll sew is a no-fuss straight line. The pattern includes cutting instructions for three block sizes12", 6", and 3". Buckeye beauty is an easy quilt block with lots of opportunity for contrast variations. The finished block size is 10" square. The traditional cactus pot quilt block has just enough half-square triangle "blossoms" to give the design a nice, prickly texture, but not so many that it becomes a chore to stitch. Make your cactus pot scrappy or go with a ​color theme. Stitch up a batch and have fun arranging the blocks into different layouts. This is a take on the patchwork cat variations that have become pretty much traditional in recent years, and slightly different from a paper pieced cat pattern. You can dress the kitty up or down as suits you. It finishes at 12" square and is a cinch to assemble.